Right to left: Mr Luqman Mamudu (Director, Policy & Planning), Mr Alan R. Tousignant (US Counselor for Economic Affairs), Engr. Aminu Jalal (DG NAC), and Mr Joel A. Kopp(Economic Officer) in NAC DG’s office. 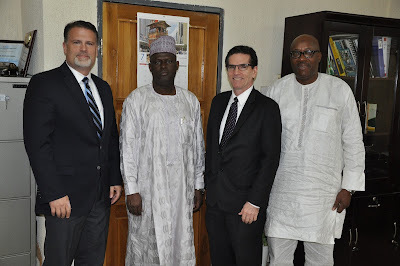 Officials from the Economic Affairs Department of the US Embassy in Nigeria on Thursday visited the Headquarters of the National Automotive Council (NAC) in Abuja, a statement by NAC said. The statement said the visit was like a follow-up to the recent visit of President Muhammadu Buhari to the United States of America. It said the officials went to make enquiries on the Nigerian Automotive Industry Development Plan (NAIDP) with a view to informing the investment decision of American government and its business community. The Director General of NAC, Engr. Aminu Jalal and Director, Policy and Planning Department, Mr Luqman Mamudu, received and briefed the visiting embassy officials led by the Counsellor for Economic Affairs, Mr Alan R. Tousignant. Tousignant said that there had been an upsurge in the amount of business enquiries from America shortly after the recent visit of President Muhammadu Buhari to the United States of America. He said that, in recent times, there had been several business enquiries from potential American investors relating directly to the Nigerian auto industry, and therefore he needed to know more about applicable tariff structure. He also asked to know about incentives, availability of skilled personnel, current total installed capacity, local value addition, industrial clusters and infrastructures, applicable safety standards, annual national vehicle demand, export potentials to other countries, amongst others. According to the statement, Jalal expressed appreciation to the US officials on their visit, presented them with copies of the Nigerian Industry Development Plan (NAIDP) and answered all questions and enquiries on the Auto Policy and general investment climate in Nigeria. The Director General said he was excited by the keen interest shown by American companies and businessmen in the Nigerian Auto Industry; pointing out that already, two American auto giants, Ford Motors and General Motors had confirmed their interest to start vehicle assembly operations in Nigeria early next year. He said Nigeria is Africa’s largest economy with a huge market for automobiles, stressing that the auto industry policy was intended to transform Nigeria into a major vehicle manufacturing hub for leveraging on Nigeria’s abundant trainable labour force and material resources especially petro-chemical-based. He also said that with a population of over 170 million, Nigeria could not continue to run an import dependent economy, the statement read.